A special Sri Chakra Navavarana Achana is performed on Poornima (full moon) on the Sri Charkra crystal Meru at the feet of Ma Durga. According to Sri Vidya, there is a uniquely auspicious energy available to us on the full moon day, so this day is especially good for worshipping Sri Lalitha Maha Tripura Sundari Devi with Navavarana Sri Chakra Puja. 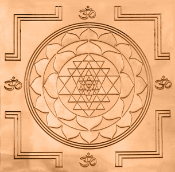 Navavarana refers to nine enclosures, veils, or layers that are contained within the scared Sri Chakra design. Each avarana contains a certain number of triangles, petals or lines that correspond to specific aspects of Divine Mother's powers of Love. When this powerful puja is performed on full moon day, the powerful energy of the full moon is magnified with the energy of the mantras and yantras, and creates Divine vibrations of Sri Lalita Devi, with nectar like blessing from Divine Mother. For this puja, Pandit Phanikanth Sharma, a Sri Vidya Upasaka, worships the Sri Chakra Meru that is installed in the Durga Mata shrine. Temple invites everyone to join the Sri Chakra Puja. Whoever performs or witnesses the puja, will receive the most loving and compassionate blessings of Sri Rajarajeswari Devi. Sponsors will have their Gotram and names included by the Priest. Sponsor 1 puja or 12 months of pujas (on Poornima each month).